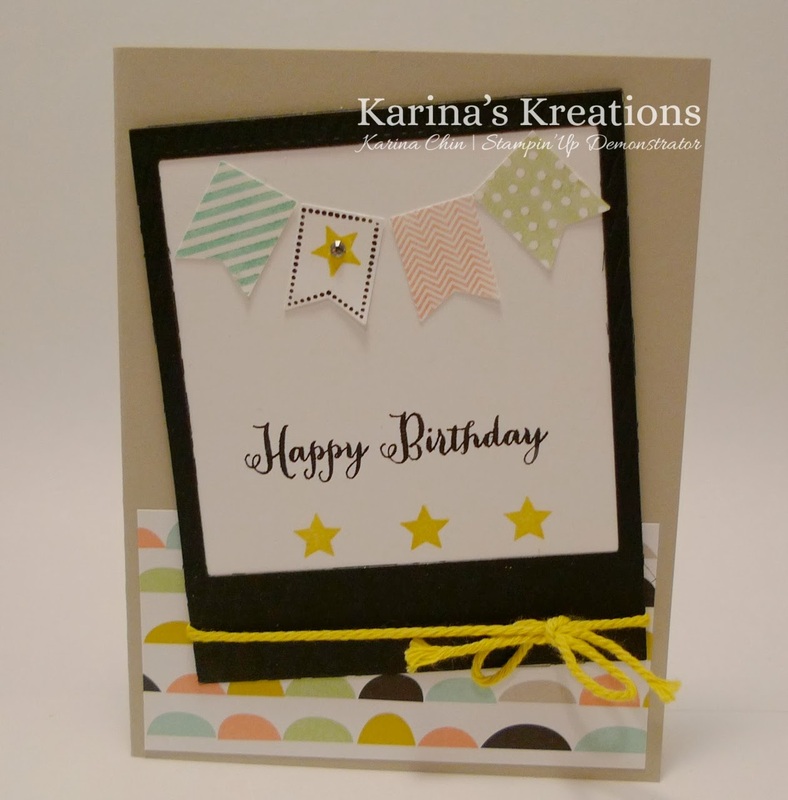 Karina's Kreations: Stampin'Up Countdown to Sale-a-bration Day 4! Stampin'Up Countdown to Sale-a-bration Day 4! It's Day 4 of our Sale-a-bration countdown! I just spent 8 hours today typing up instructions for my 20 card birthday card class this Sunday! Are you coming? It's going to be fun! 1. Attach the Designer Paper to the card. 2. Cut the frame shape using the On Film Framelit Die and Basic Black card stock. 3. Stamp Happy Birthday with Jet Black Stazon ink. 4. Stamp three stars under the greeting with a Summer Starfruit marker. 5. Attach to the Frame with Mono Multi Glue. 6. Tie Summer Starfruit Baker’s Twine around the frame and attach to the card with Dimensionals. 7. Make 4 banners with Pool Party, Crisp Cantaloupe, Pistachio Pudding and Basic Black Stampin’ Write Markers. Stamp a star in the center of the black dotted banner with a Summer Starfruit marker. Add a Rhinestone Jewel. 8. Punch out with the Banner punch and attach to the card. I hope you like my card and you'll be inspired to check out one of my classes, or book a private stamp night or an online event!